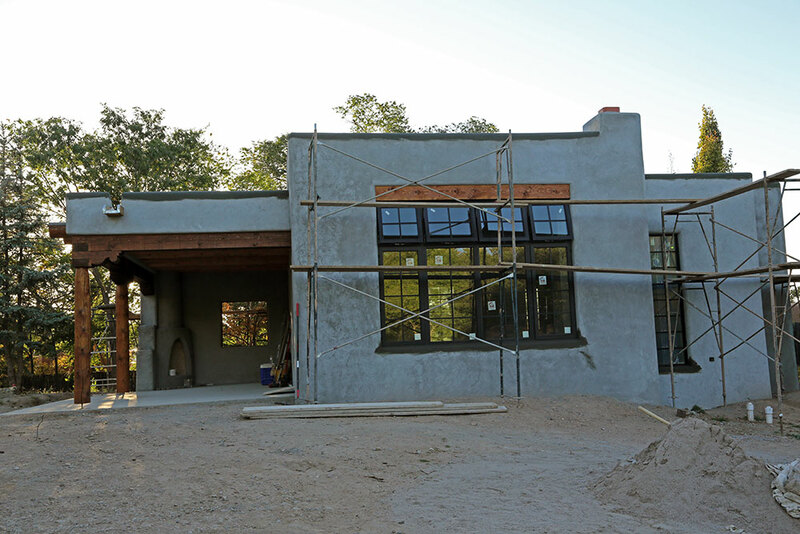 The outside stucco scratch coat is completed, including waterproofing of the parapets, etc. 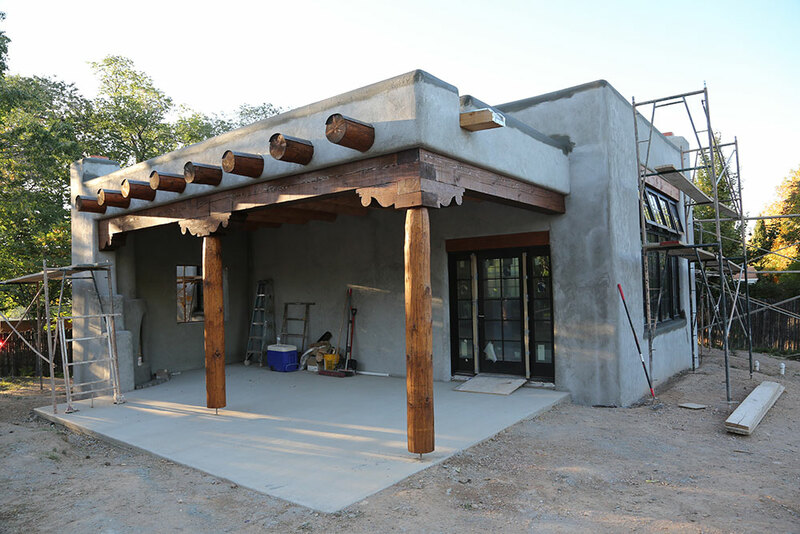 The vigas and portal wood works have been stained. Now the outside will cure and harden for a few weeks. Exciting to have come this far! 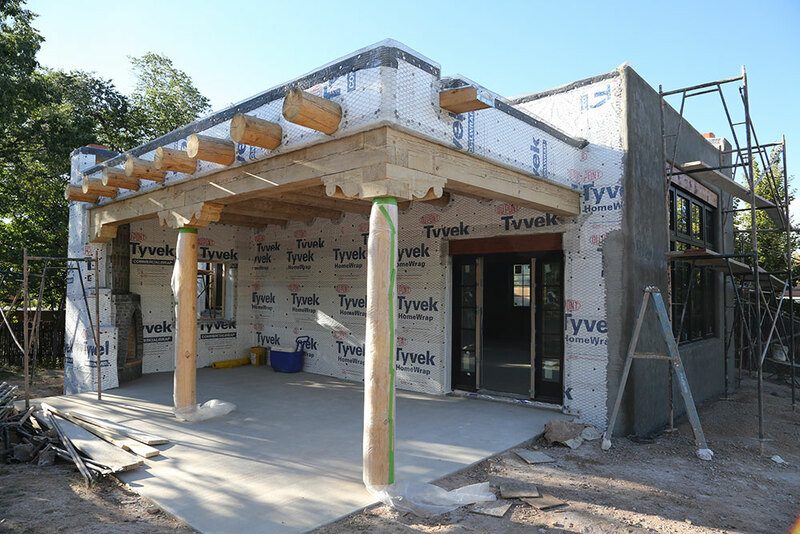 The outside wall had been “insulated” on the inside and then stuccoed and it looked wrong, so we tore off the stucco and insulation and re-did it and now everyone is happy! 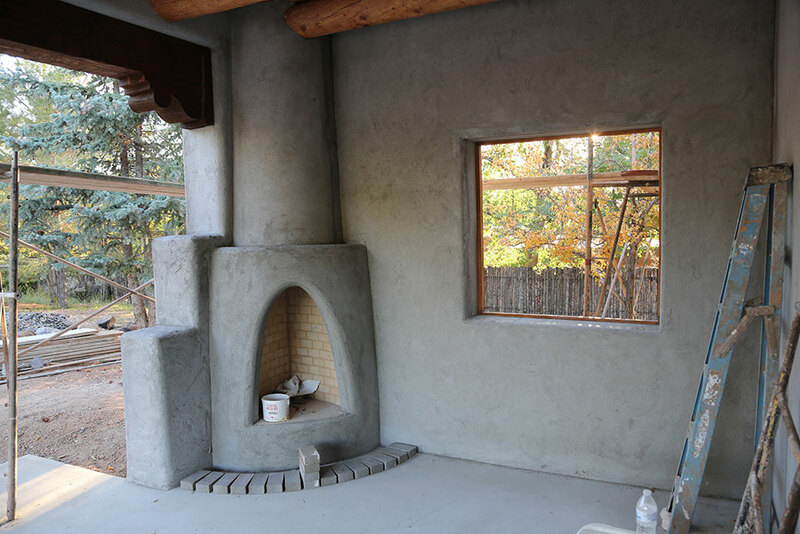 We will build a hearth for the outside fireplace. When the walls are completed with color, we will pave the portal with bricks. 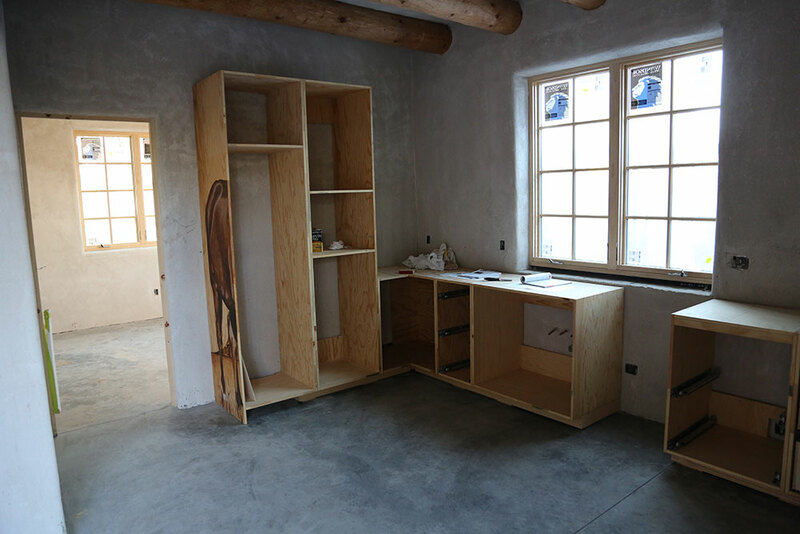 While the new concrete floor is curing I have been able to install the kitchen cabinets, which have been stored in one of our guest rooms. It was tricky and time consuming, but it worked out very well. Ready for the stone countertop! On Monday the tile guy is going to start in the bathroom! 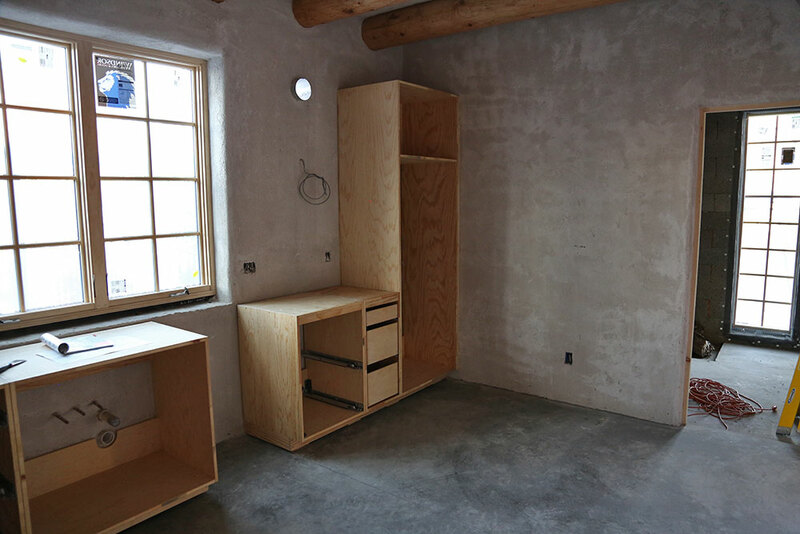 And Oscar, Daniel and Rodrigo will start doing plaster on all the inside walls. Exciting times! Scott Mutz and his team at Advanced Concrete Design started pouring the final concrete slab at 7 sharp this morning. 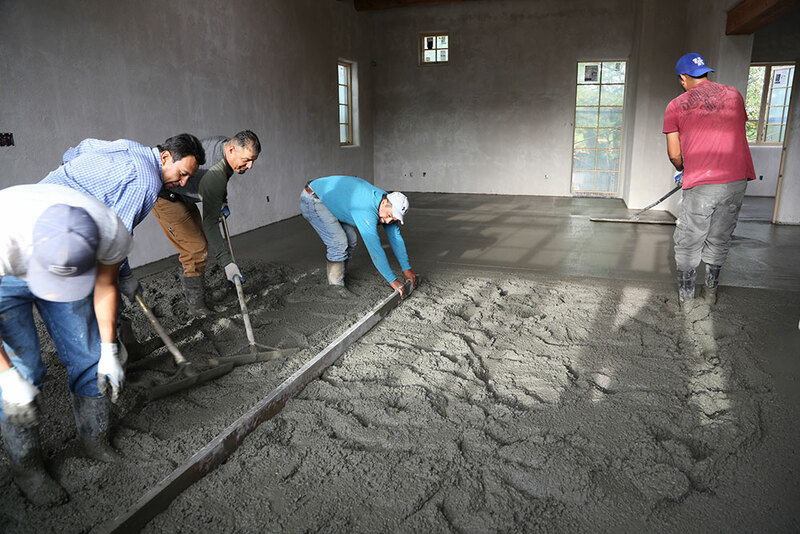 Three inches of concrete in the entire casita (except the bathroom) and when they were done they about a half wheel barrow of mud left! 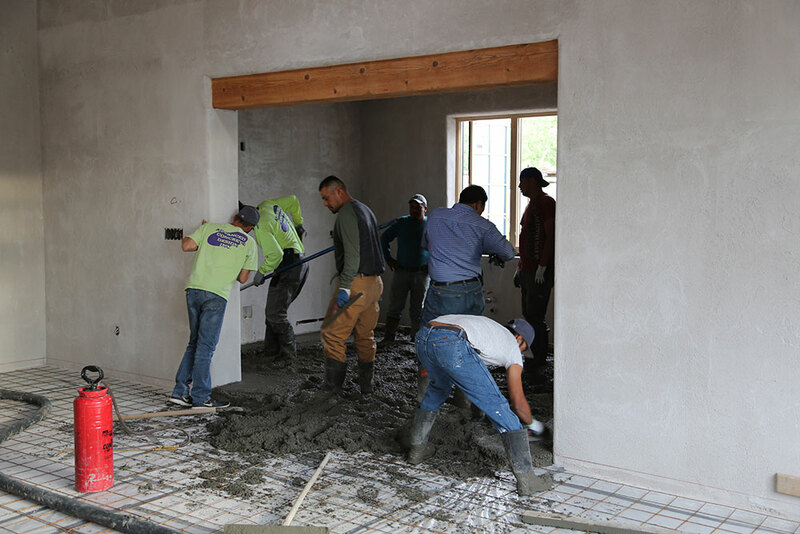 Always exciting to see a large team work on a pour! 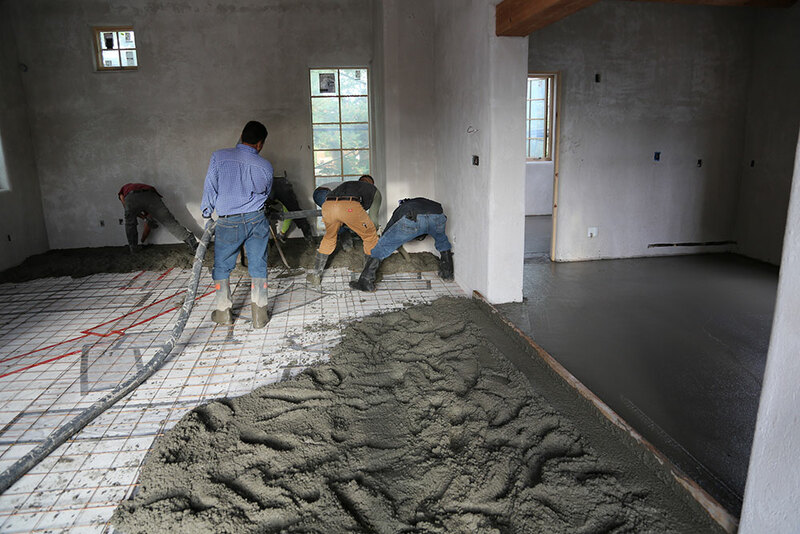 Crowded as the bedroom/office and the kitchen area is being poured. More room to move around in the studio, at least for a while. Getting more and more crowded as they are coming closer to the entrance door. The pour is complete, two hours of hard work later. Now it has to sit a while before they can start working up the surface. So much is happening and I hardly have time to update the blog. 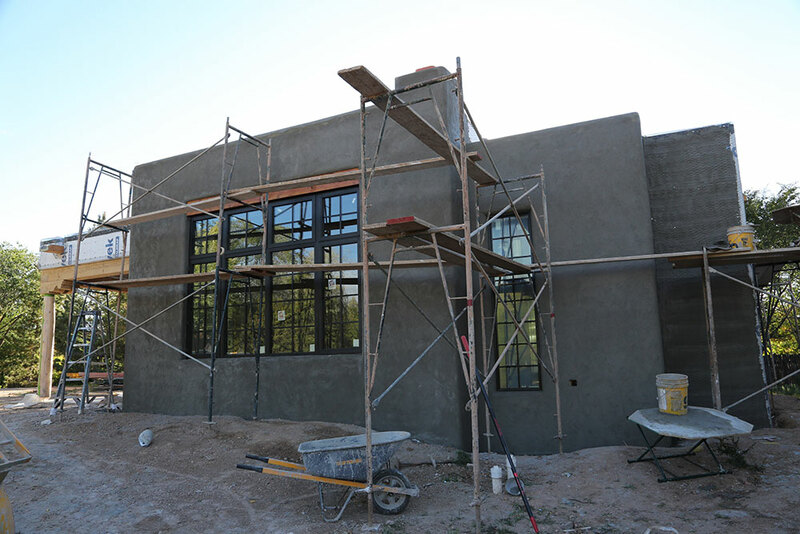 Now stucco is being applied by Oscar, Daniel and Rodrigo. It is a joy to see them in action. 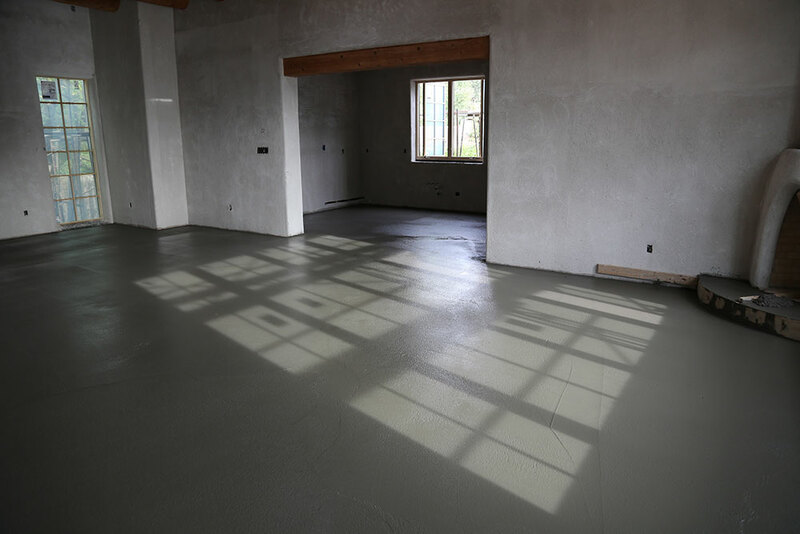 It won’t take them long to wrap around the house and then they will do it once more with the final colored coat. That will be exciting. 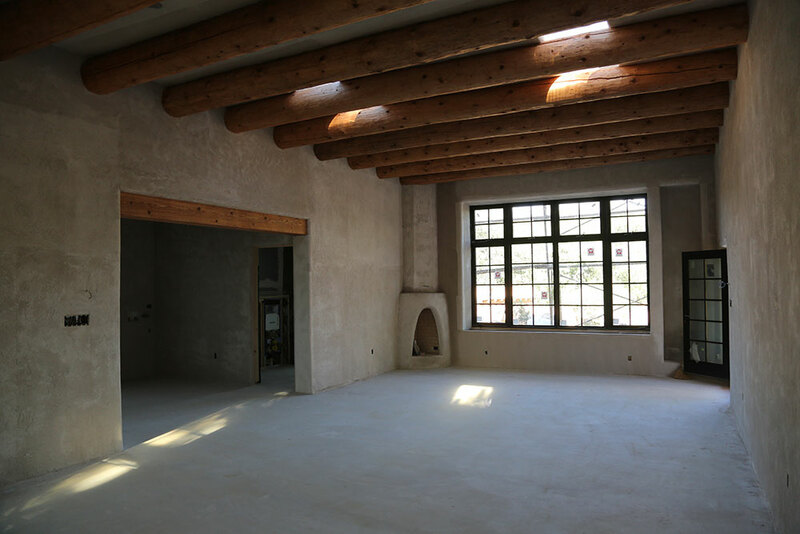 Beginning to look like a Santa Fe house! This color is actually pretty nice, but we will have the usual Santa Fe sand color, anything else won’t be approved. In the studio all vigas have been stained. Now we are waiting for the second slab of concrete to be poured, which will happen soon. The studio from the other direction. 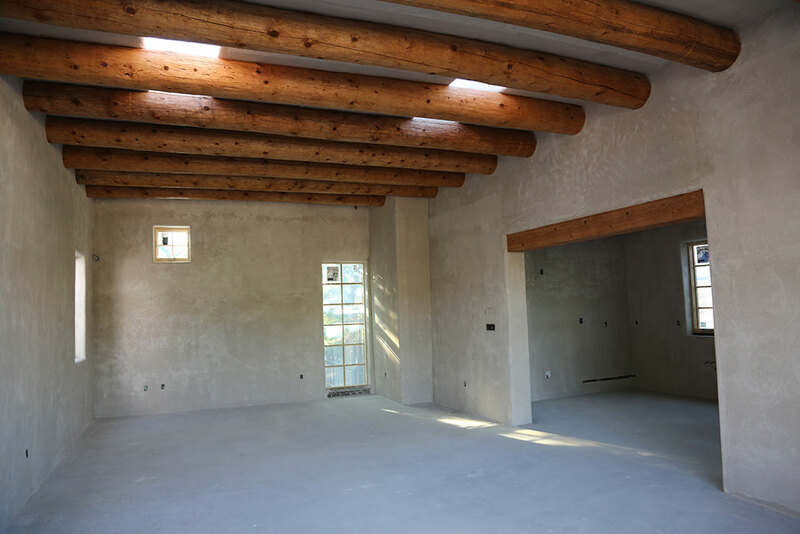 The walls and the ceiling will have another coat of plaster, which will be white. We will try to keep it a bit rough, old style. The room beyond the studio will be the kitchen. I expect to install all the cabinets a few days after the concrete floor has been finished. Very fun and exciting.